Nintendo has always been known for dominating the portable gaming space, but much of its early success can no doubt be chalked up to the viral popularity of Tetris, which came as a pack-in game. The block puzzler has since become an institution of gaming, with a version available on just about every electronic device with a screen and close to 200 million copies sold in total. Tricky Towers—an indie game new to Switch—aims to build upon that tried and true formula with a unique twist, and it largely succeeds in this effort, making for a fun and frustrating (in a good way) experience that’s sure to be a hit for game nights. Gameplay in Tricky Towers will be immediately familiar to anyone who’s played Tetris, as it’s fundamentally the exact same thing with the one key difference being that bricks are affected by kinetic physics. Building a tower is straightforward enough at first, but one block placed in a less-than-ideal position could throw off the structural integrity of the whole thing, bringing all but the bottom tumbling down if it sways too far to one side. It’s a goofy idea to be sure, but one that injects a delightful amount of devious chaos into the classic Tetris gameplay. Tricky Towers is a primarily multiplayer focused title—with both local and online multiplayer on offer—and it’s best experienced with a friend sitting next to you on the couch with a Joy-Con of their own. There are three primary modes on offer - Race, Survival, and Puzzle - with each one having a unique take on the same core concept. Race is exactly as it sounds, with a checkered line being set high above the ground and the winner being decided by who can reach it first. 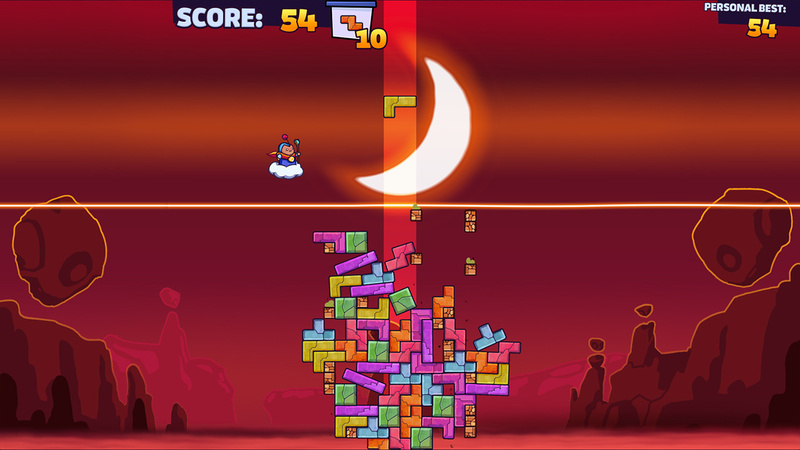 Survival is somewhat similar, with players all being given a set number and order of blocks to stack, but if too many blocks fall off a tower into the abyss below, that player is eliminated from the running. 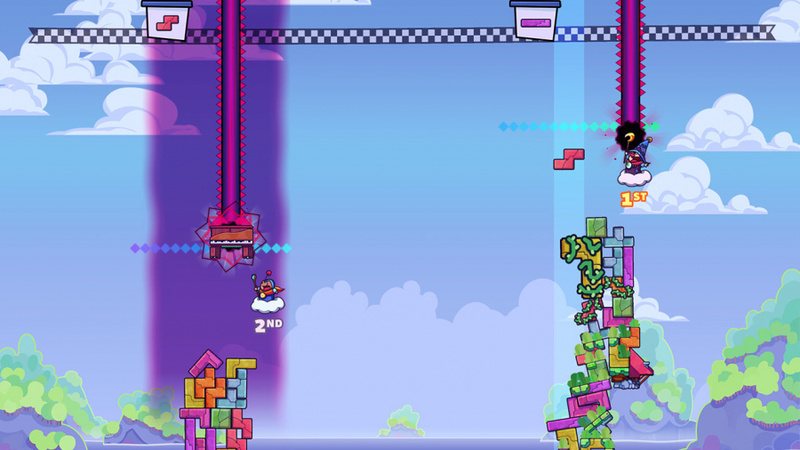 Puzzle mode is the most unique, as it has a laser being blasted across the screen and tasks players with stacking as many blocks as they possibly can under it. 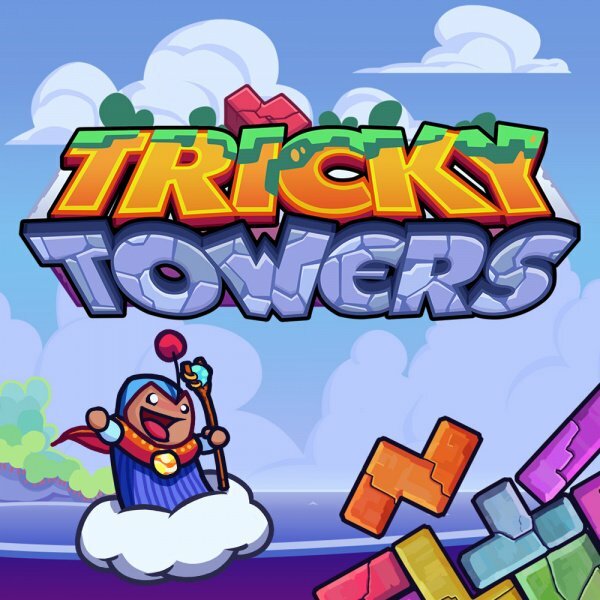 The underlying physics of Tricky Towers shine brightest in this latter mode, as it becomes a game of figuring out which side of your short tower can best bear the load of the next block. All of these modes are interesting and fun enough in their own way, but the gameplay is deepened considerably with the introduction of magic. In Race, for example, passing a certain threshold with your tower grants you the usage of one magic spell, and this can be used as either Light or Dark magic. Light magic helps the player casting it, offering up helpful buffs like a vine-covered block that secures several blocks surround it, or a lightning bolt that allows you to delete the last block you placed or dropped. Dark magic then does the exact opposite by hindering an opposing player, such as a thick fog that obscures where to put incoming blocks, or by making their next block enormous to potentially knock over their quivering tower. Difficulty settings can be turned up to help make this an even more engaging experience, as newer obstacles are thrown into the mix to keep players on their toes. Race mode introduces strong winds on its highest difficulty, potentially blowing over weak towers, while survival introduces waves of random dark magic. After getting a new player acclimated to the controls and general flow, these extra settings go a long way towards levelling the playing field further and making the game far more interesting. In practice, this all combines to make for a raucously enjoyable experience that is constantly dynamic. It doesn’t matter how much better one player is than another, as the numerous variables that the physics and magic introduce ensure that nobody is sure to win every time. All it takes is one misshapen or rogue element to bring the top half of your tower down, making you that much more frantic and sloppier as you try to make up lost time by rebuilding. Similarly, a seemingly hopeless tower can be completely turned around by the usage of a helper platform or some vines; there were plenty of impressive comeback moments from our review sessions. For those of you that prefer to play only in single player, there’s a little bit less content on offer. 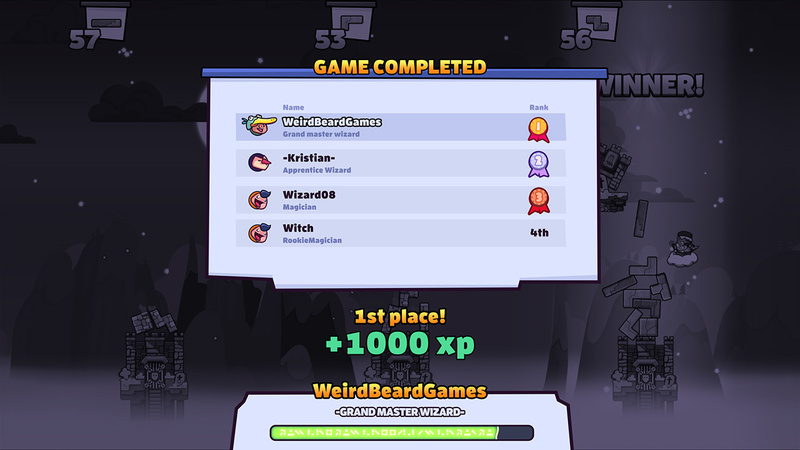 There’s an ‘Endless’ mode that sees you going for a high score on each of the three modes, which is then posted to a global leaderboard, and there’s a collection of fifty level-based ‘Trials’ which functionally act as handcrafted, isolated instances of the three modes in multiplayer. These trials are separated into five different difficulty categories, with later difficulties only unlocking once you’ve passed a certain number of trials. The main issue that we have with this single-player mode is that it doesn’t offer very much in the way of incentivizing the player with enticing rewards, which makes it feel like more of an afterthought. Before entering a single or multiplayer game, players can choose which character they’d like to play as before choose a theme for their bricks, and we were under the impression that more would be unlocked as you progressed, but this is not the case. The fact is, you can’t unlock any content by beating levels or playing a certain number of multiplayer games, instead you must buy new block skins or characters via the eShop. We’re in full support of having DLC—especially the cosmetic kind—being offered to enhance a game, but there’s something that feels off about having such a wealth of content available for additional purchase when there are only four characters and four block themes in the base game. In terms of presentation, Tricky Towers manages to find a cute, wacky art style that fits well with setting the overall playful theme. You build your towers on top of stone wizard shacks, against bright, sunny backdrops or starry skies, and the wizards all have a squished, impish look to them that goes perfectly with all of the grunts and howls they make when casting magic or losing blocks. Similarly, the music goes for a goofy and fun aesthetic, with kazoos, tubas, and whistles all being par for the course in the perky tunes that play while you battle to keep your tower standing. Tricky Towers offers up a cool twist on a puzzle classic, and the focus on multiplayer battling makes this an ideal game for showing off the Switch’s unique capability for multiplayer gaming on the go. 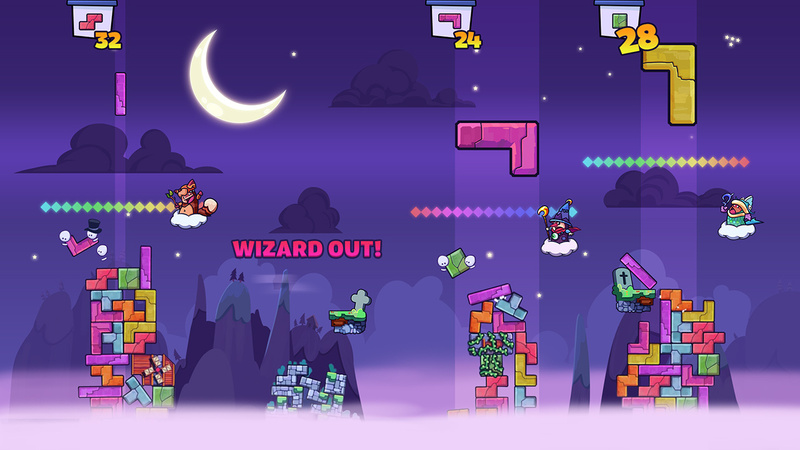 Everybody knows how to play Tetris, and Tricky Towers does just enough to build on that core concept to make the game interesting and weird enough to be quite memorable. 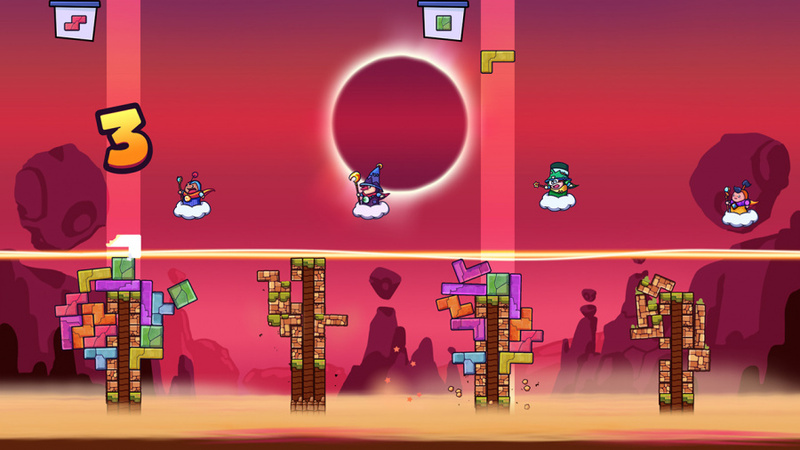 Although the single player offerings are a bit on the slim side, we enjoyed our time with Tricky Towers and would highly recommend it for anybody looking for a good couch multiplayer or puzzle game. Anyone remember Fortress on GBA? It was like Tetris and tower defense combined. I enjoyed this for a while on PS4, but my problem with it was that I always reached roughly the same point before it all went wrong and there appeared to be nothing I could do to make the tower taller. It works best as a two+ player competitive game but as a single player puzzler I don't think it works well. One for those lucky enough to get four people crowded round the TV I think. @exopiscea Eggmania was a lot more fun! This is a game that had it's short-lived experiences. I own it on PS4, and wasn't too thrilled by it, but hopefully the company continues to make games for the Switch. They've made many games on the PS4, some of which are fairly good and others are bad (Pharaonic was pretty horrible with controls). However, the company can be good, so hopefully, we get some pretty decent puzzles on the Switch! This was one of those PS+ "free" games I downloaded, played for a few days, loved, moved on the something else, forgot about, and then deleted a few months later. I will say though the matches I had against buddies online for those few days were frantic and hilarious. It's got Octane's Seal of Approval. The fiance and I are having a great time with this game in between Mario Party and Towerfall! Missed the pre-order sale, but I'm a sucker for this type of game. Tetris is my hands-down-favorite game of all time and I needed this in my life... worth. it. @BANJO memories. Do you remember Flimbo? Has anyone ever played Quarth? It's an underrated Konami game that has been described as ''Space invaders + Tetris''. I agree, I found that a little annoying. It doesn't affect gameplay but it still would have been nice. I do think the game is worth the price, especially if you have people to play it with. This is one of those games you play between Mario Party and Mario Kart. Something you can only really enjoy when playing against friends.